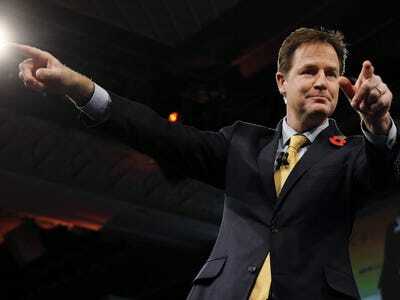 REUTERS/Suzanne PlunkettDeputy Prime Minister Nick Clegg. Barring a sudden reversal of fortune over the next six months, the Liberal Democrats are going to lose big in the General Election next May. Yet the party that has pushed most vociferously for a change in Britain’s “first-past-the-post” voting system than any other also looks set to be its biggest beneficiary. Even with a much diminished share of the vote, they could still hold the balance of power. 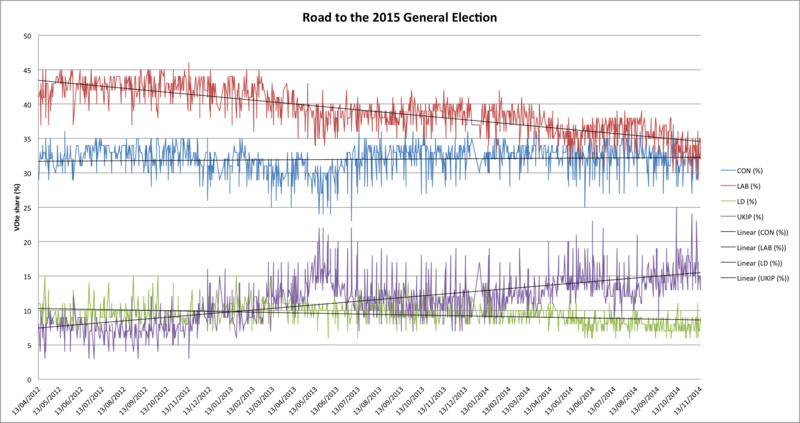 Over the past two years a clear picture has begun to emerge over more than 1,000 political polls. 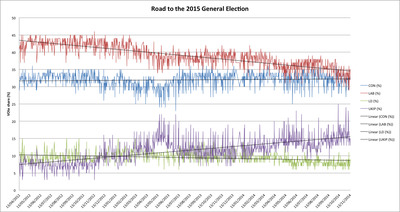 While Labour have maintained a lead over the Conservatives it has been gradually eroding. Those losses may previously have lead to gains for the UK’s longstanding third party — the Lib Dems — but not any more it seems. Based on share of the national vote the third party at next year’s election looks set to be Nigel Farage’s UK Independence Party (UKIP), which surged to levels of popularity not enjoyed by the Lib Dems since 2010. Meanwhile the latter’s support has fallen into single digits, a calamitous fall from the 23% the party won at the last General Election. 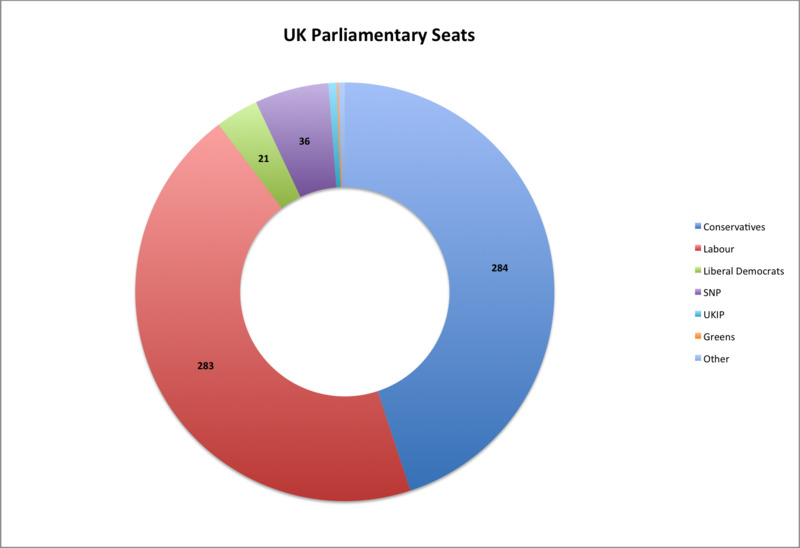 Election Forecast UKProjected number of seats by party. So based on this metric UKIP’s surge in the polls may translate to as little as 4 parliamentary seats while the UK’s third biggest party by seats could be the Scottish National Party (SNP), the same party that lead the charge to pull Scotland out of the country in September’s independence referendum. To compound the irony, it could achieve this feat by winning only 3.2% of the national vote. The Lib Dems, meanwhile, would become the fourth-largest party despite a projected loss of as many as 36 of the seats it won four years ago, and a sharp drop in its share of the national vote (although it’s still expected to be around three times larger than the SNP’s share). If the current forecasts prove relatively accurate, what is abundantly clear is that for even a minority government to be formed a deal will have to be done with either the Lib Dems and/or the SNP. This will give both significant bargaining power — perhaps even more so than after the 2010 elections where the Conservatives won almost 50 seats more than Labour. This time both will be in a strong position to woo smaller parties. At the very least this is likely to mean a return to coalition government with the Lib Dems holding a number of powerful cabinet rolls. It seems, at least in the UK, losing almost half of your voters these days is not such a disaster after all.